Pulsing synths, big thumping hits explosions with powerful percussion. Exhilarating, electrifying, high voltage tunes. Epic, dramatic, energetic tracks for crime, war and terror. Sport, actionsports, advertising or hight action drama. Building tension with fast synth sequences and rolling percussion. Very fast bombastic track for fast sequences and chases. Powerful tension with big percussion, horns and strings. Perfect for pursuits. Mysterious secret mission with powerful drums. Thoughtful, serious and strong track. Dynamic strings and oriental singing. Works well for action scenes, political documentation as well as docutainment. Synthesizer, piano, distorted sounds accompanied by energetic strings create a chaotic, hectic driving sound. With an orchestral finale. 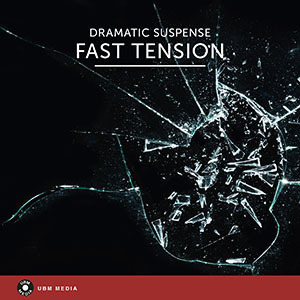 Action-packed, suspense-filled orchestral track which evokes feelings of danger and threat. Drums, synthesizer, cymbals, strings and male chorus reminds one of battle scenes and images of fast interaction. Perfect for trailers. Post apocalyptic guitar with big drums. Perfect for trailers and powersports. Epic, heroic and large choir. A track for future games. Epic, highly dramatic score for adventure and extreme drama. Like a descent into madness. Starting with steady hi-hat, string accents and piano that evolve into a big thrilling score. Dramatic and unstoppable! Fast, dramatic noise with strings. Energy for a dark urban drama. Dramatic tension; electronic with string accents. Fast-paced, nervous track for a wild chase in an urban setting. Very troubling; something dangerous is steadily approaching. Heavy bass and fast synth arpeggios. Deeply atmospheric with fast electronic drums. This fast paced piece will make you run (for cover). Defined rhythm and orchestral fills will make you the center of action. Bombastic Dubstep meets bombastic cinema! Perfect for big performance, trailers, advertising, new cars and more. Classic trance track meets dubstep and then flows into a cinematic orchestra. A perfect dubstep epic track for trailers, adverts or great action performances. Goosebumps feeling.